8- to 10-speed transmissions: The need for speed. | BG Products, Inc.
8- to 10-speed transmissions: The need for speed. Bikes with no gears are the worst. Those tiny trick bikes look cool when you want to pop a wheelie but they are not efficient for travel. It’s a rite of passage when a kid graduates from a bike with training wheels and foot brakes to free-wheeling with hand brakes and multiple gears. All of a sudden, hills are easy. Distances are a piece of cake. The only downside is you will lose those quads of steel you developed from brute-force pedaling up and down and around the neighborhood. The same is true for automatic transmissions in vehicles. More gears = more efficient. It all began with gears. In the 1940s, modern automatic transmissions were just beginning to be mass produced. With four forward gears and a reverse (no park), the Hydra-matic automatic transmission was a revelation in the auto industry. Over the years, like the worry lines on my forehead, the number of gears in automatic transmissions has steadily increased. Basically, the goal was to speed-up and smooth-out shifting in automatic transmissions. With the driving force of fuel economy standards, automakers continued to add more gears to automatic transmissions. Transmissions have evolved a great deal in a relatively short amount of time and so has the way we maintain them. But one important thing from that early innovation remains today: fluid offers the key role of transferring power to drive the wheels. Do more gears mean it’s faster? No. More gears alone do not make a car faster. Think back to the bike. More gears didn’t make that bike faster, the engine (human legs) did. Additional gears do, however, improve the efficiency of the power transfer. More gears give modern engines more gear ratios to operate in, which increases performance and efficiency. It allows for a lower overdrive gear, which improves MPG on the highway. It gives the engine that sweet spot to operate in. It improves drivability with multiple gear selections for down-shifting. The gear ratios are closer together giving the computer more options for specific operating conditions. Continuously variable transmissions (CVTs) are not ideal for high-torque and high-horsepower engines. Standard and automatic transmissions are the best solutions for high-torque engines. How many gears are they going to add? HEVs and small displacement engines will probably use CVTs or automated manual transmissions (AMTs). 8- to 10-speed automatics and dual-clutch transmissions (DCTs) will become the norm for larger, higher output vehicles. Experts predict that we probably won’t exceed 10-speeds because complexity of design will affect longevity and durability. In automotive engineering, there is a point of diminishing returns when something becomes too complex. These high-quality, modern transmissions are maintenance free, right? More gears means shifting more frequently, which means more friction events will happen inside the transmission. Every time the transmission shifts, the clutches slip momentarily to give you that nice, smooth operation as designed. However, more friction means more heat, more heat means more fluid oxidation, means more fluid breakdown and so on. And much like me on Kansas City Chiefs’ game days, the automatic transmission fluid is stressed to the max. Get a transmission fluid exchange every other year and make sure you use a quality transmission fluid and supplement. 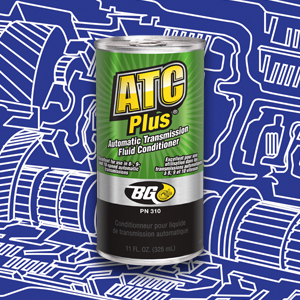 BG ATC Plus® Automatic Transmission Conditioner really shines in this arena with its ability to improve clutch operation over standard fluid. This transmission conditioner is the key to long-lasting 8- to 10-speed transmissions. And for Pete’s sake, get your kid a bike with gears already.